With the ability to provide up to 288 optical splitters in a standard 3RU chassis, or 48 in a 1RU chassis, the SplitLight modular platform offers network operators a scalable alternative that saves both rack space and costs. 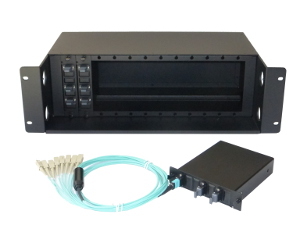 RALEIGH, N.C. - Sept. 26, 2014 - PRLog -- M2 Optics Inc., a leading manufacturer of customized fiber optic testing and monitoring solutions, announced the general availability of ultra-high density optical splitter modules using their SplitLight platform. Based on a unique packaging design, the company is able to provide a significantly larger number of optical splitters in a standard LGX-style module than alternative solutions in the market. Originally, the SplitLight platform was designed as a non-modular chassis capable of providing up to an impressive 192 splitters in just a single 1RU chassis. Despite the quick acceptance and deployment by several of the largest government entities and data centers in the world, M2 Optics realized that many users still prefer a modular, "build-as-you-go" approach to deploying splitters in the network environment. However, with rack space availability always being a critical concern and the traditional approach having several limitations, they developed a modular solution that enables users to sigificantly increase density in the same (or smaller) footprint they are used to. Each module in the SplitLight platform is capable of holding up to 24 optical splitters (1x2, 1x3, or 2x2) in a standard LGX-compatible form factor. Using their 3RU rack-mount chassis with 12 modules, M2 can provide as many as 288 splitters. Alternatively, modules can also include higher split counts (1xN) or CWDM/DWDM components for PON and wavelength-specific applications. In all cases, this solution enables users to significantly increase density across the network, resulting in rack space and cost savings across the entire network. "By adding this modular approach to the SplitLight portfolio, M2 Optics can now satisfy an even wider range of requirements for optical splitters and WDM components", states Kevin Miller, co-founder of M2 Optics. "Saving rack space is always a critical concern of operators and data centers, so a scalable and customizable platform like SplitLight provides the ideal solution as they continue to expand." The SplitLight with LGX-style modules are available directly from M2 Optics, or through one of their authorized regional sales partners. The modules and chassis can be purchased together or independently of one another, with pricing based soley upon the exact requirements of the user.